Sign up for our upcoming events today. This training program is for teenagers of all athletic abilities. Each participant will be trained sport specific. These sessions will be held Monday, Tuesday, Thursday, Friday from 11:30-12:30 July 10–August 11. $300/20 sessions. Call Parker’s Place Fitness to register today. This training program is for teenage girls of all athletic abilities. Get stronger, lose weight, and get ready for sports. These sessions will be held Monday and Wednesday from 10:00-11:00 July 10–August 9. $150/10 sessions. 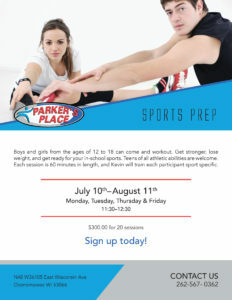 Call Parker’s Place Fitness to register today.